Liquid food supplement with iceland moss extract enriched with beta-glucan and vitamin C, for children over 1 and adults. 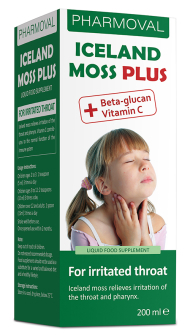 Iceland moss relieves irritation of the throat and pharynx. If there is any sign of un unexpected reaction, seek medical attention. Not recommended for children under 1.